The ban on single-use plastics bags will go into effect in Chicago this August onwards. However, it will be applicable only to large chain stores and franchise stores in the initial phase. CHICAGO (Scrap Monster): Chicago city’s ban on single-use plastic bag is to go into effect on August 1st. The bill passed in April bans grocery stores from providing customers with plastic carryout bag at the point of sale. Instead, stores must provide reusable bags, recyclable paper bags, or commercially compostable plastic bags. The stores are allowed to sell these bags by charging the customers. The ban will be applicable to large chain stores and franchise stores. In the first phase, only large chain stores- group with more than three locations under the same ownership and franchise stores more than 10,000 square feet will fall under the ban. The smaller chain stores and franchise units will get another year to completely phase out plastic bags. Convenience stores and restaurants too are exempted from the ban. Among those stores that will be hit immediately includes Target, Wal-Mart and Gap. Incidentally, many of the big retailers including Walmart have come up with new ‘reusable’ bags that are thicker than single-use plastic bags. 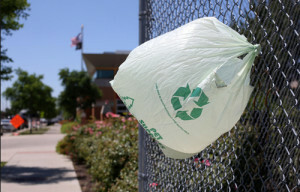 The ordinance allows retailers to offer plastic reusable bags that are at least 2.25 millimeters thick and can hold at least 22 pounds in them. Consequently, an outright ban on plastic bag is still far away from realization. The violation of the law will attract fines ranging from $300 to $500. The ban is being proposed to reduce Chicago’s waste and litter. However, environmentalist groups warn that the ban could actually backfire, as it still allows use of plastic bags.